Recommended for: ReVeluv, and fans of house track and its subgenres. NOT recommended for: Debby downer and negative nancys. Also, plant liberation activists. Most of Red Velvet title tracks are catchy and Red Flavor is no different. First few seconds in and it will hook you right away. Its catchiness level is somewhere between Russian Roulette (lower frequency) and Rookie (off the scale). Not too much, just nice. Something you want to listen to during summer while enjoying a Tropicana party. Splash and splatter some fresh citrus (avoid contact with eyes, it’ll sting!) and move your hips with the beat, and you find yourself dancing à la Red Velvet’s sixth (6th) member that nobody asked for. Red Flavor’s arrangement is pretty basic, it is actually a generic fast tempo dance pop song. But it’s far from boring. 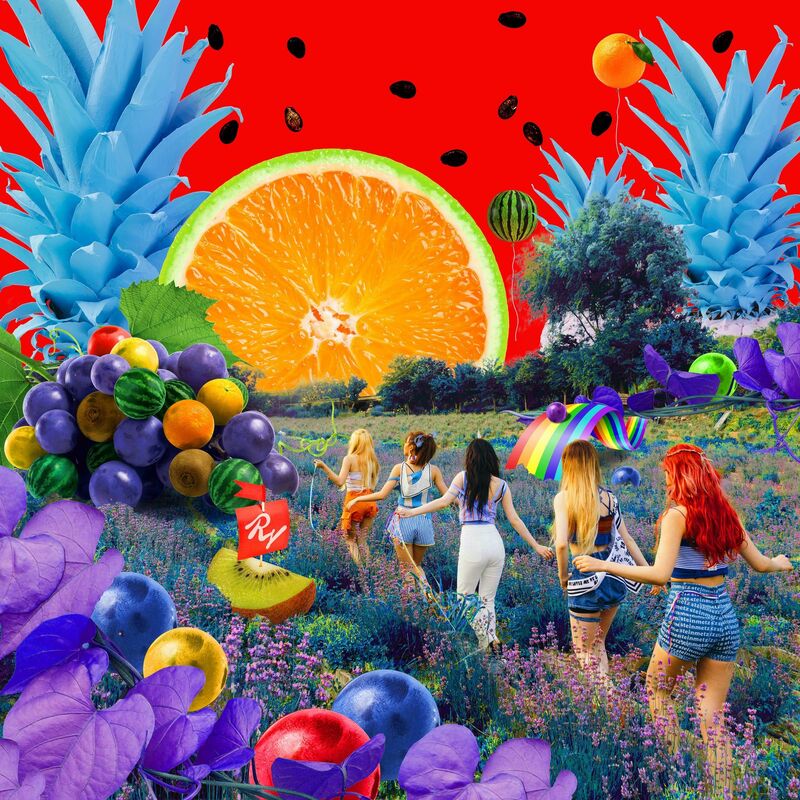 Red Flavor has energy, and a unique Red Velvet’s flavor that makes us keep coming back for more (for a few days at least), albeit being quite formulaic also means that the track can be tedious to listen to in the long term and forgettable. Hey, Irene and Yeri’s pineapple pen rap parts are fairly good don’t you think? It adds something for our brains to anticipate next time we listen to Red Flavor. Surely not spitting bars but those two are not designated rappers. So what’s the verdict? Red Flavor is a very fitting track to liven up your dull summer and blue pineapple is now my favorite fruit. That’s my verdict. Once you’re done with blue pineapple party, left sober, what you need is a song that will act as a reminder of what you are and why are you here in this world. But seriously unless the party went trippy, you won’t need such a reminder because surely at most you just drank all the pulpy orange juices. Not drunk, but your water reservoir is overloaded. Alas. Moving onto the right lane, Red Velvet is here to offer you just that with You Better Know. The track is a much needed commercial break. Being an alternative mid-tempo pop, You Better Know is a common b-side by Red Velvet. But there’s a twist to its tale. It’s summer remember? Thus the song is incorporated with an added fuel cell to go extra miles. More energy, more fun! This track is good enough to get you going, up and ready for the next track waiting in line. ..and now we’re in a zoo. Well, that escalated quickly. Guys, we’re lost! Told you not to take the blue juice. Sigh. Although, this zoo is groovy. Very groovy indeed. Zoo is a tropical house track that elevates this mini album to new heights. It’s not summer without a tropical house hits these days. There are elements of dancehall (minute) and Balearic house (major influence), although not to be confused with future house as tropical house falls under the deep house genre. Zoo would make you feel like you are currently raving it up in Ibiza beach party but with dancing animals. All the animals are well equipped with tropical house fundamental instruments such as marimbas and pan flutes, all while accompanied by 4/4 kick drum beats somewhere from the heavens. Lord, this song is so good it makes my writing campy. Luckily, all the energy spent in this zoo won’t hinder us from taking a sip of Mojito for our next trip. Summer needs mojito. Mojito needs summer. That’s just how it (should) work. Red Velvet knows what’s up, and they are well prepared. Despite having bits of Girls Generation’s Party and flashes of Mojito Queen Tiffany, this track is more energetic and of a faster tempo. Red Velvet is younger (as in average members age and also the group’s age itself, don’t kill me Sones) than SNSD during the time of release so it’s just apt. A fun and uplifting song, whilst nothing special and has no depth for me to appraise. Ah. Frankly. I love every slow-tempo Red Velvet songs. They just know how to hit where it feels the most. At this point, I’m already tired of sitting too long whilst carefully listening to each song, then babbling and rambling about them. A lethargic but worthwhile experience. Hear the Sea makes it much much better. We want to end this on a high note and the track absolutely delivered. Mellow yet warm. It’s not a sad song but it will drag you into a journey of an endless loop of reminiscing. One thing about Red Velvet that makes them slow-tempo track specialist is that the members compliment and harmonize each other perfectly. All of them have different singing tone, distinguishable, somehow it doesn’t stop them from coordinating seamlessly throughout a song. Not many realize this and they deserve a credit not only for having catchy title tracks but also premier b-sides.